No matter what President-elect Donald Trump might say, bringing iPhone manufacturing to the US is probably never going to happen. We’ve covered the reasons why making an iPhone in the US doesn’t make sense before, but a new report from The New York Times highlights a new factor: Huge incentives and concessions made by the Chinese government. The Times’ report profiles a Foxconn plant in Zhengzhou, China. Zhengzhou is known as “iPhone City” by locals, and when the factory is at full production, it can make 500,000 iPhones a day. It’s the world’s largest iPhone facility, making about half of all iPhones globally. What’s notable about the factory isn’t its scale, but how much money the Chinese government has given Foxconn to make the factory the ideal place to make iPhones. The confidential government records obtained by The Times detail multiple meetings over several years in which Zhengzhou city officials discussed their “support” for iPhone production, calling the benefits a “preferential policy.” The records offer a snapshot of those benefits, including the specific aid for Foxconn in multiple areas, like infrastructure, labor, taxes and exports. Those government benefits, according to the Times, include, financing the construction of of the $600 million factory, giving another $1 billion to build housing for the hundreds of thousands of workers, offering discounts on power costs, eliminating corporate taxes and value taxes for five years, and even helping with the training and recruitment of employees. And that’s before we get into some of the logistical concessions. The factory is purposefully built within a few miles of an airport, so that Apple can more easily send its products out to other countries. And perhaps most importantly, the factory itself is built inside a bonded zone. A bonded zone functions much like a diplomatic territory, in that the government regards it as foreign soil. The zone eliminates the need for global brands to pay duties or taxes on imported components. And it makes it unnecessary to physically export the goods. In those zones, products can be imported and exported virtually at customs, without crossing a single border. After that, they can move swiftly around the country, or out to the rest of the world. Apple told the Times that it knows about the government’s support, but that it didn’t have any specific knowledge of of the subsidies Foxconn gets. Foxconn for its part, says it’s “grateful” for the support the support of the government. But tax breaks aren’t going to build huge facilities. And whatever aid a Trump Presidency might promise, it’s hard to imagine it could compete in any meaningful way with the subsidies and aid the Chinese government has offered Foxconn in iPhone City. 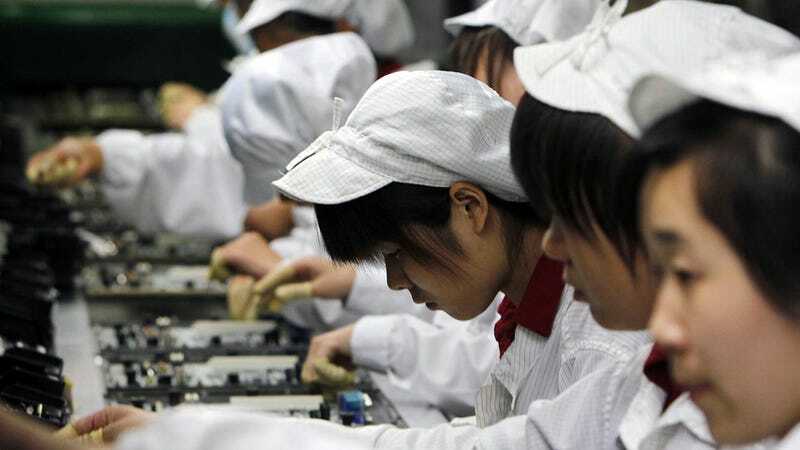 Putting aside all of the other unrealistic reasons why iPhone won’t be manufactured in America—lack of skilled labor is a big one—the fact is the Chinese government and Apple’s biggest manufacturing partner have a pretty sweet setup. And that’s before you consider that the cost of labor is lower and many of the components being assembled are also made in Asia. Moreover, this is before we even get into the questions of what Apple would accomplish if it made an iPhone in the U.S.. An American-made iPhone might make some buyers feel good, but ultimately, the iPhone is a global product. When President Obama asked the late Steve Jobs what it would take to make an iPhone in America, Jobs was clear, “those jobs aren’t coming back here.” Years later, that appears to be absolutely true. No matter what Donald Trump says on Twitter.